This manuscript contains prayers for Sukkot (the Festival of Booths), Yom Kippur (Dayof Atonement), and Hanukkah (the Festival of Lights). Large letters and ornamentation emphasize the starting words. The manuscript contains two drolleries for the reader: monkeys wearing jester’s hats that are chained to palm-like columns and enjoying tasty treats. 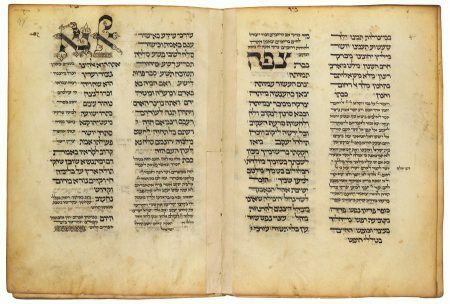 With the text variations for the synagogue rites, this copy is one of the most important sources for religious traditions in the Jewish community in medieval northern France. Mahzor (Prayer Book for the Holy Days), 13th/14th centuries, copied by Hayyim ben Isaac, France, parchment.